The fire fighters based at these stations undergo continuous training to ensure that the service we provide is of the highest possible standard. In addition, fire officers are available to give fire safety advice and to ensure that standards are properly maintained to ensure public safety. 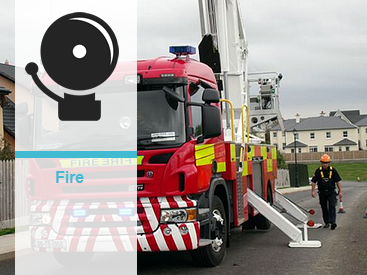 On average the fire service attends over 1500 incidents per year. The fire service headquarters is based at Limerick Road, Nenagh. These offices administer all items relating to the operational fire service, fire safety, building control, emergency planning and petroleum licensing. What are the Building Control Regulations? The Building Control Regulations apply to new buildings, extensions, material alterations and changes of use of buildings. They promote observance of the Building Regulations by supplementing powers of inspection and enforcement given to Building Control Authorities. Failure to submit a Commencement Notice is an offence and may have serious consequences, which cannot be regularised at a later date. You may have difficulties in selling your property if you cannot prove that the statutory requirements relevant to the property have been met. Additional charges will be imposed by the Building Control Authority for commencement notices which are not submitted online via the Building Control Management System. Building Regulations are a set of legal requirements for the design and construction of new buildings, extensions and material alterations to and certain changes of use of existing buildings. Building Regulations provide for, in relation to buildings, the health, safety and welfare of people, conservation of fuel and energy, and access for people with disabilities. A 7 day notice is similar to a Commencement Notice and may be used for works, which require a Fire Safety Certificate, when the works need to start before the Certificate is granted. It must be accompanied by a valid Fire Safety Certificate application and a Statutory Declaration. After the 1st March 2014, the additional requirements which apply to commencement notices will also apply to 7 Day Notices. The fee for a 7-Day Notice is €250 or €5.80 per square metre of applicable floor area (whichever is the greater). A Commencement Notice is a notification to a Building Control Authority that a person intends to carry out works or a material change of use to a building which the Building Regulations apply. The notice must be given to the authority not more than 28 days and not less than 14 days before the commencement of works or the change of use. Once validated by the building control authority, works must commence on site within the 28 day period. What is a Certificate of Compliance on Completion? For work coming within the scope of S.I. 9 of 2014, a Certificate of Compliance on Completion must be lodged with the Building Control Authority and placed on the public register before the building may be opened, occupied or used. The Certificate must be signed by the Assigned Certifier and the Builder. It certifies that the building or works have been carried out in accordance with the Building Regulations. Do all developments require a Commencement Notice? • works in connection with the material alteration (excluding minor works) of a shop, office or industrial building where a Fire Safety Certificate is not required. What happens if I change my Builder or Assigned Certifier during the construction works? The owner of the building must notify the Building Control Authority within 14 days of such changes and must submit new Notices of Assignment and undertakings. Failure to do so is an offence. What happened on the 1st March 2014? • the submission of certificates of compliance on completion. What happens if ownership of the building, or works changes during construction? Under the new Regulations, the new owner of the building must notify the Building Control Authority within 14 days, in writing. Failure to do so is an offence. Do the additional requirements apply to all Commencement Notices? Extension of a dwelling by more than 40 square metres. Works which require a Fire Safety Certificate. What will I be charged for scanning documents to my online application ? What additional documents must I submit with my Commencement Notice? Any other documents deemed appropriate by the Assigned Certifier. What happens if I do not start work within the statutory notice period of the Commencement Notice? If the works do not start within 28 days of the date of lodgement of the Commencement Notice, you must submit a new Commencement Notice prior to the commencement of any works taking place. What happens if I don’t submit my Commencement Notice? Failure to submit a Commencement Notice when required is an offence. If you commence works or a change of use in the absence of a Commencement Notice, there is no provision to retrospectively submit a Commencement Notice. For works subject to S.I. 9 of 2014, you will be unable to submit a Certificate of Compliance on Completion, and your building will not be recorded on the public register. This may affect your ability to lease or sell the building. If I received planning permission before March 1st 2014, am I exempt from the new Regulations? No. All Commencement Notices received by the Building Control Authority after the 1st March 2014 must comply with the new Regulations. Who can act as an Assigned Certifier? Can I build my own house myself or by direct labour? Yes. You may appoint yourself as the builder if you believe you are competent to carry out that role and sign the Certificate of compliance (Undertaking by Builder). As the builder, you are responsible for compliance with the Building Regulations. You must sign the Certificate of Compliance on Completion and you must also appoint an Assigned Certifier to inspect the works during construction. As an owner, how can I appoint a competent builder? A competent person may generally be regarded as a person who possesses sufficient training, experience, and knowledge to enable them to undertake the project tasks they are required to perform having regard to the nature of the project and its scale and complexity. Who is responsible for compliance with the Building Control Regulations? The owner of the building, the designer who designs the works, and the builder who carries out the works are responsible, under law, for compliance with Building Regulations and Building Control Regulations. Can I submit my Commencement Notice Online? Yes, a new national Building Control Management System (BCMS) is now in place. Plans, specifications, particulars, and the preliminary inspection plan can be uploaded to the BCMS. In addition, the online assessment of the proposed approach to compliance with the Building Regulations is also done through the BCMS. The BCMS will allow building owners nominate an Assigned Certifier, and a Builder for the development works. The BCMS will also allow the Owner, Assigned Certifier, and the Builder to fill out the required Notices and Certificates online. Each party must be registered with the BCMS to fill in or sign their respective parts. Can I still submit my Commencement Notice at my local County Council offices? Yes, Commencement Notices can still be submitted at the offices of your local Building Control Authority. As a minimum requirement it is essential that smoke alarms are fitted in the hall and landing of every home. Tipperary Fire Service supports Carbon Monoxide Week 2016 which runs from 26th September to the 2nd October. Here are some general guidelines on fire safety and awareness this Christmas. This national online system allows you to apply and electronically pay for short and long commencement notices. Please register for long commencement notices with a valid email address.